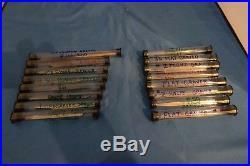 Engraving Tools Bundle of 16 tools includes E. MULLER and GRS & GMT tools. Please review pictures and the list below. The list include description from tube/tool. 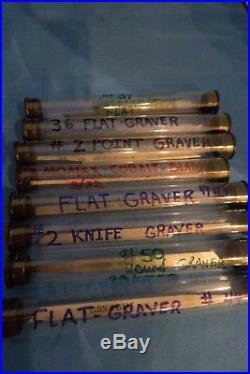 #44 FLAT GRAVER - GRS & GMT HSS N-18. #43 FLAT GRAVER - GRS & GMT HSS N-16. KNIFE -BEUEL GRS & GMT HSS N-2. 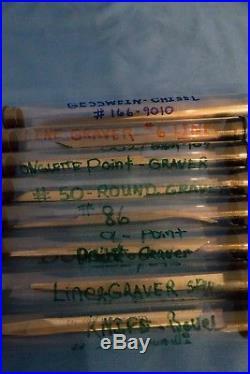 OL - Point Graver 002/690 H.
002/693 Liner-Graver 14-6 Straight E. #50 Round Graver 22-750 GRS & GMT HSS N-2. MOMAX - cobalt - blank 3/32 HCT. 002/702 OLVGLETTE POINT - GRAVER H. LINE GRAVER #6 LINES 16 6 E.
The item "Engraving Tools Bundle of 16 includes E. MULLER/GRS & GMT" is in sale since Sunday, December 2, 2018. This item is in the category "Jewelry & Watches\Jewelry Design & Repair\Jewelry Tools\Engraving Tools". The seller is "karfranci_3" and is located in Portland, Oregon.